In a solid week of gray, foggy mornings and rainy afternoons, I found sparkle and shine at my bead table, stitching up some colorful baubles to beat away the blues. 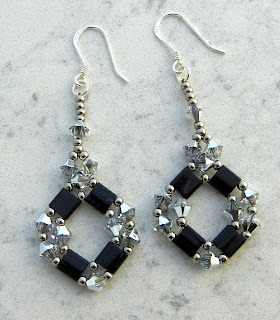 Continuing with my earring-a-day project, this week I’ve added 5 more, all fit for a party. 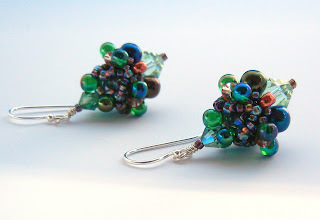 Bright with greens, purples and golden orange, these would be perfect for Mardi Gras. The pattern, which uses two sizes of drops along with peanut, 11 and 15 seed beads, is Cindy Holsclaw’s Pagoda Charm. Blue is a big accessory color this year, and I love to contrast it with yellow-orange. This is another component from Maggie Roschyk’s Artistic Seed Bead Jewelry. 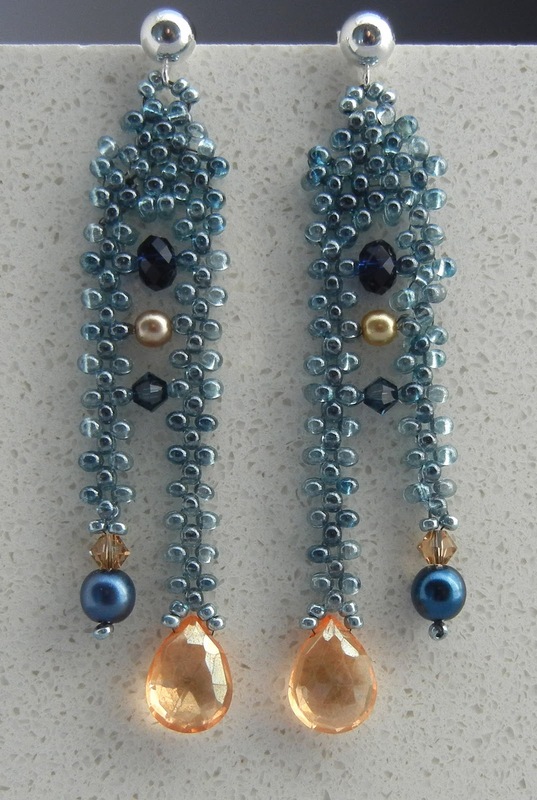 I don’t know when I’ve been so inspired by a beading book! 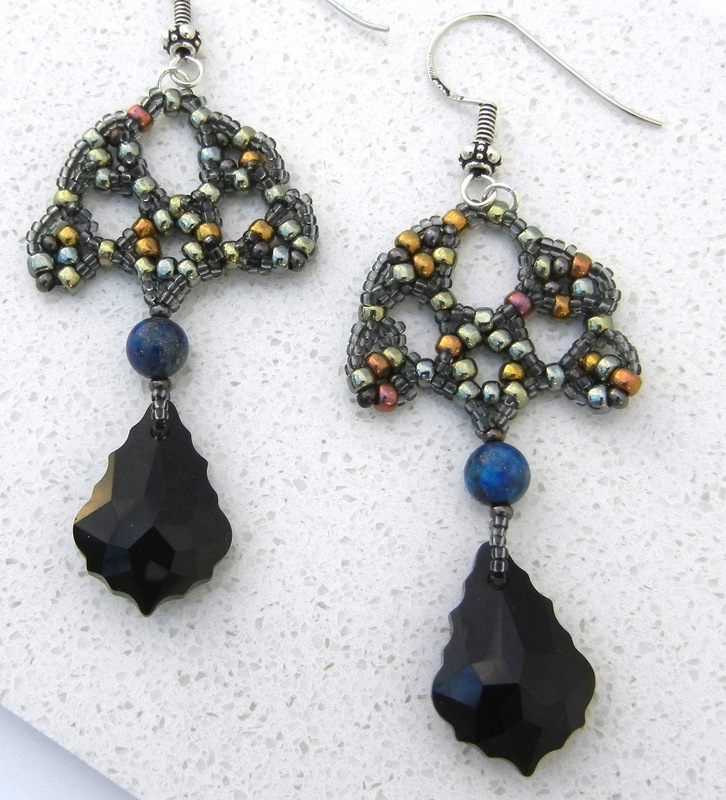 I can see these done up in so many different colorways and accent beads. Classic black and silver never goes out of style. 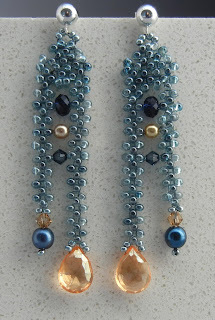 Deborah Roberti’s Diamond Tila pattern gave me a chance to use up more of these tile-shaped beads from my stash. 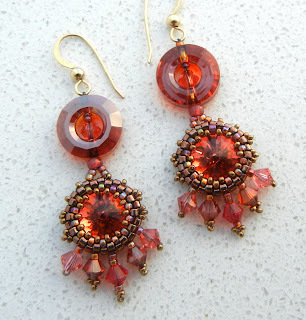 Double the sparkle, these dangles with red magma cosmic rings and padparadscha rivolis pick up and reflect light from all directions. 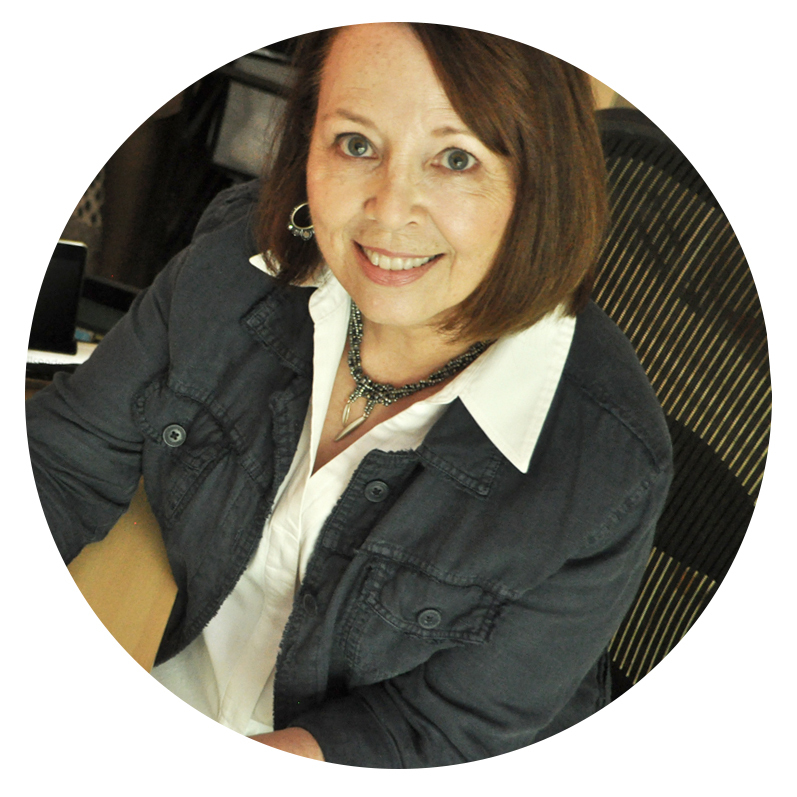 Gwen Fisher’s three-dimensional designs are always fun and challenging. Her Deco Lotus earrings gain enough wow-factor from a second layer to make them just right for special occasions. I just came from the Bead & Button website, and they have a matching bracelet pattern in the free-to-subscribers downloadable content, and had just coincidentally downloaded it! Your colors are much better than theirs! And by black & white, I meant black and silver. Duh. It seems,You have infinite amount of ideas for them.I like the sophisticated elegance of the 'silver-black'.Should be worn on special ocassions.